Chicagoan Arash Amini believes in environmental and agricultural sustainability, civic responsibility and economic development. Through aquaponics, he has brought all three of these components together. In college at the University of Illinois at Chicago, where Amini earned a physics degree in 2010, he became enthralled with environmental science and environmental engineering. After graduating, he and some friends started a next-generation agriculture company, 312 Aquaponics. But his vision kept evolving, and in 2013 he founded FarmTower Co. in order to deliver affordable aquaponics systems to the public. Chicago-based FarmTower Co. is in the business of designing, building and distributing indoor farming systems which utilize aquaponics, hydroponics and vermiponics (growing plants in water that is nutrient-rich from vermicomposting). Farm towers, through vertical farming, allow people to grow organic food in any location. He was first exposed to aquaponics in college, when he saw a friend’s aquaponic operation for the first time. “He had the thing in his living room, with cucumbers all over it,” says Amini, who was amazed. After college, Amini says he had no idea what starting a business meant. Later, he and some friends traveled to Milwaukee to visit an aquaponics facility. It was then he realized how much he still had left to learn. Amini said FarmTower Co. is not yet profitable. In fact, he has gone into debt due to startup costs. He cited the necessity of “creative financing,” but expects to cover costs this year, and is optimistic regarding the company’s financial outlook in 2014. He expects income to flow through the company’s three main services: custom farm consulting, kits and books. Even in the most industrial of urban areas, unused warehouses and other buildings can be turned into custom farms, where food can be grown year-round due to climate control, Amini says. With FarmTower Co.’s expertise, Amini expects his clients will be able to make money, create jobs and conserve resources through vertical farming. Those who are unable to take advantage of FarmTower Co.’s consulting services may still order commercial-grade kits. The kits can be shipped all over the world, and different kits are tailored for homes, schools and restaurants. Kits will be offered later this year online at www.diyhomeaquaponics.org. Amini has also written a book titled DIY Aquaponics: The Definitive How to Guide. Published on Aug. 6, 2013, it illustrates nine different aquaponic systems. He felt such a book was needed because of the general public’s lack of knowledge about aquaponics. He recalls going to a Home Depot store recently, where the staff knew nothing about this system of farming, despite the fact that all of the materials needed for an aquaponics system may be purchased at the store. While profitability is a goal, it is not the only thing that motivates Amini. He feels that it is the responsibility of those in the industry to address the general public’s lack of knowledge regarding aquaponics. 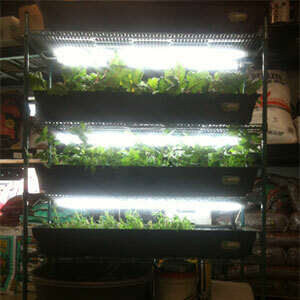 Therefore, he aims to spread the gospel of aquaponics through his company’s services. While bullish about the future of his company, he acknowledges that there are obstacles. These include lack of maturity in the market. “The market for aquaponics is so young,” he says. But Amini is confident in his product, and says he will do whatever it takes to be at the cutting edge of aquaponic systems. “I don’t see anyone with better designs out there,” he says. Amini believes the selling points for vertical aquaponic systems can be summed up in three words: light, efficient, cheap. He also is very aware of his role in a movement that has the power to transform agriculture. “In the next five to 10 years, indoor farming will touch almost everyone’s life,” he says. He compares indoor farming systems with computers, and expects they will evolve to a point an where the systems are and user-friendly and affordable for many people. Amini has worked with the city of Chicago and its mayor, Rahm Emanuel, in setting standards for indoor farming within confines of the city limits. Last year, he designed an aquaponic system for the town of Candelaria, Honduras. He has also spoken to the Chicagoland Chamber of Commerce on how the region can become a hub of green innovation. “2014 is going to be the year of aquaponics,” he says.